I have been knitting quite abit. I am looking forward to putting up pictures after Christmas. I have a couple of projects to share though. I started back on my Joy of Sox sock yesterday as well. I also knitted a swatch for The Sweater. I now have a successful swatch. I need to figure out the colorwork now. It may be too much for my brain. I finished my test knit for Susan. It was very fun. First of all, I loved all the different stitches. I learned a ton knitting this hat. I think I have already mentioned the bobbles. Cascade 128 = really fun bobbles. And that horizontal cable. I knitted a narrow long strip and then picked up stitches around to start the bobble section. 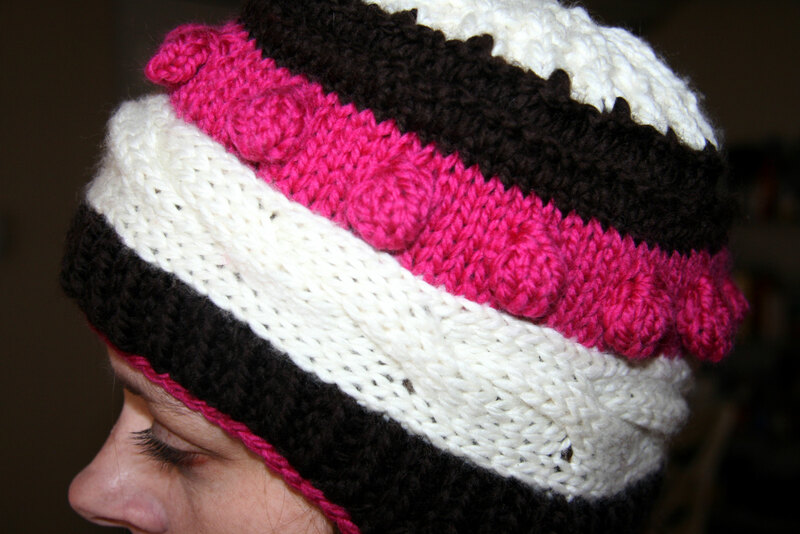 It was a type of hat construction that I’d not tried before, and I loved it. 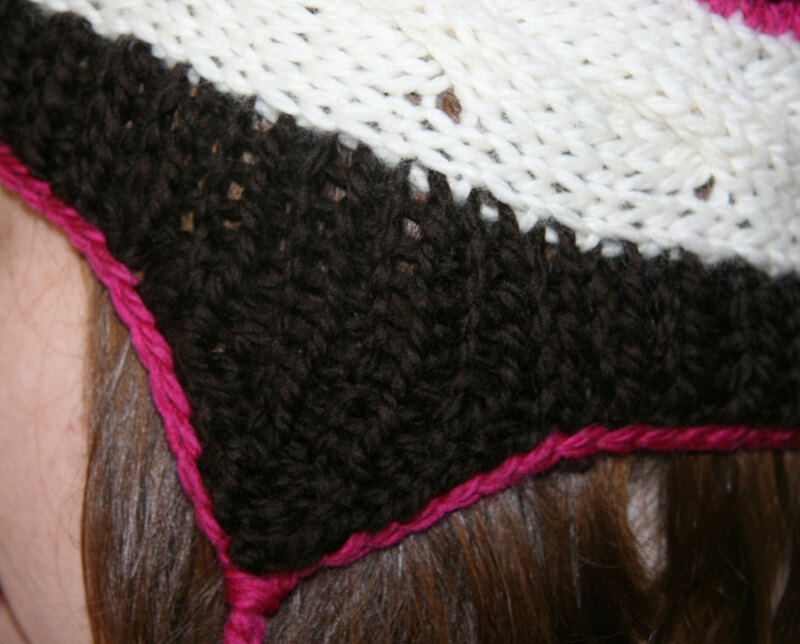 I ended up picking up stitches on the other side of the horizontal cable at the end to do the chocolate rib. It doesn’t get much better than talking about knitting in terms of ice cream. I’d wanted to try a hat with earflaps. They were easy and fun to knit. I loved doing the crochet slip stitch edging in strawberry as well. This was just a great hat. I need a front photo of it as well, but the photo that David took of me, I think I have about 12 chins, so I couldn’t include it. I’m vain that way. It is comfy (although next time I’d knit in 1/2 size bigger as I did not quite get gauge, and I think it would be great just a tad bigger.) It would be fun to try out in different colors as well, although I highly recommend that Cascade 128. Great yarn. 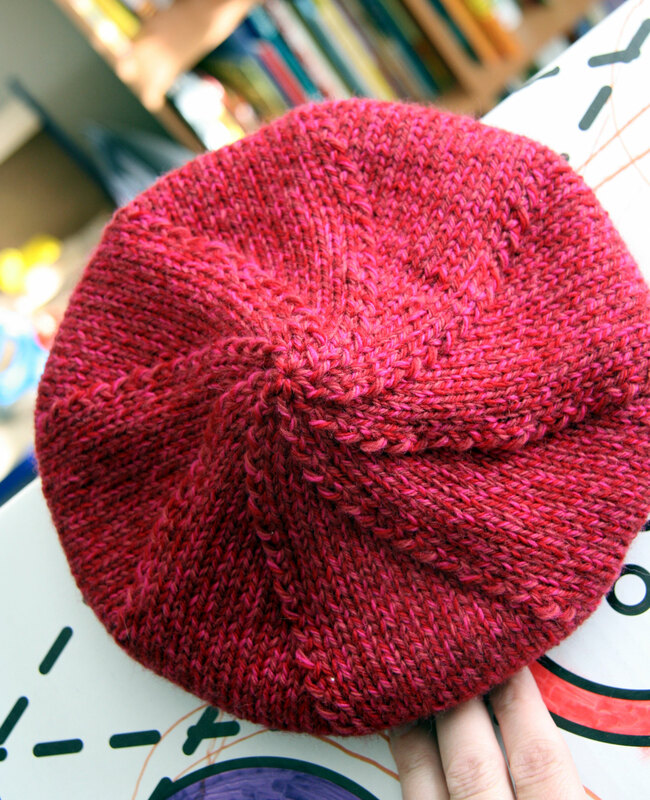 Then I knitted this little beret. I’ve knitted this pattern once before. I love it. I love the spiral decreases. I tried to model it on my chocolate covered fairly unwilling model. Such a fun hat. It’s a surprise for my sweet little niece. Well I have three sweet little nieces. This sweet little niece is 5 and currently has strep throat. I hope she likes it! Nice hat! and a cute beret! 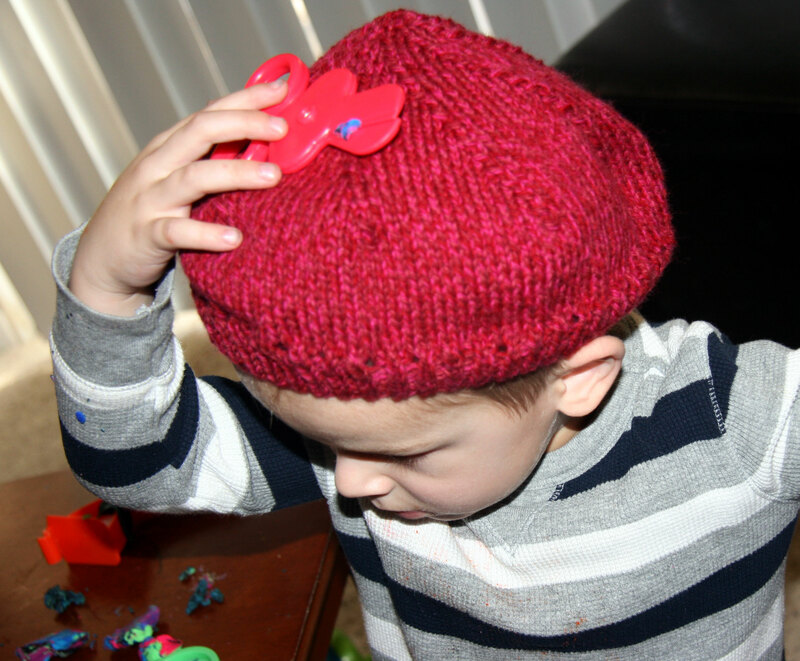 but of course the beret model is the cutest! !